Oh. My. God. That is cool. 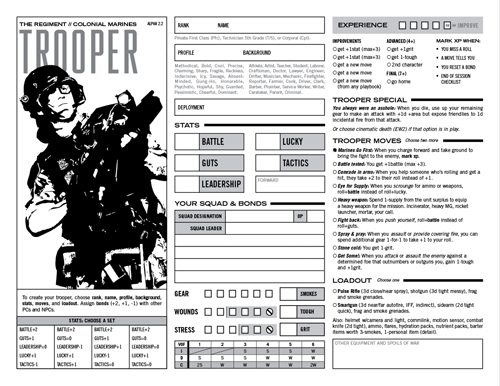 I was an early adopter of Apocalypse World, and we got our mileage out of it but migrated back to traditional games. This might get me to spend more money on the AW system... nom nom nom. Hello. Recently I ran into this blog and fascinated with all the RPGs. I looked through it and Ghost/Echo is really appealing. I have an idea that is a hack of Ghost/Echo, but Ghost/Echo do not show ccl unlike Lady Black Bird or Danger Patrols. Am I allowed to use the concept of "2d6, one for goal, one for danger" ? Of course, I will send you the finished one if you want one. Yes, go ahead! I'd like to see what you come up with. I'm new to Strategicon. I love Aliens and this sounds awesome! Sorry to be the noobie, but is there a sign up somewhere? Or is it first come first serve? This site isn't affiliated with Strategicon, sorry!